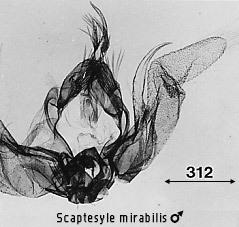 Scaptesyle mirabilis Hampson, 1900, Cat. Lepid. Phalaenae Br. Mus., 2: 284. Scaptesyle mirabilis Hampson; Holloway, 1976: 2. Diagnosis. The forewing border is relatively narrow with a double indentation basally, the colour enclosed within it orange. Habitat preference. The species is common on G. Kinabalu, flying by day. It occurs from 1500m to 1930m. Two specimens were taken on G. Api during the Mulu survey, at 1500m near the Pinnacles and on the summit at 1710m.